You vill obey update . . . The domestic policy differences between Hillary and Obama are negligible. But the Clinton camp likes to claim that his national health care plan would leave 15 million people out, whereas hers covers everyone. Let's put aside for the moment the fact that former Clinton cabinet member Robert Reich says the Obama plan would actually wind up covering more people. The key to Hillary's claim that she would cover everyone is that . . . she would punish people who refuse to fall in line. Naturally, Clinton isn't eager to specify just what such punishment would be. But under intense questioning by Tucker Carlson on his MSNBC show this evening, senior Clinton advisor Kiki McLean employed an Orwellian euphemism. People who didn't comply wouldn't be punished. They'd simply incur an . . . "outcome." TUCKER CARLSON: If you're going to mandate health insurance, what if people don't, don't obey? And she has said "we're going to garnish wages." Which wages, and how much? Cause she's the substance candidate. KIKI MCLEAN: She is the substance candidate, and she's looking at the options. She's also said, Senator Obama's team has tried to put out an attack saying she's going to force people who can't afford it to pay for it themselves and that's just not true. 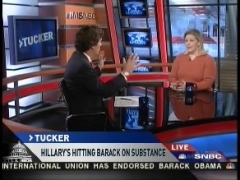 CARLSON: But she's said herself, she's said herself, that she'd be willing to garnish wages. I think that's pretty much exactly what she said. CARLSON: If she's running as the candidate who's thought it through, who has a plan -- I think the phrase is "on day one" -- then you really do get down to the nuts and bolts, which are, how are you going to punish the recalcitrant people who don't want to go along with her master plan? MCLEAN: Here's the other part of the plan, Tucker. And that is what she said very clearly in a debate, and that is, if you want universal coverage, you gotta to start at the very beginning with that being the goal: to get everybody in the process, getting everybody covered, and that's the difference. Barack Obama doesn't even begin that. CARLSON: She's soft-selling the stick. She's selling the carrot; she's not talking about the stick, the punishment for not going along with her vision of the Brave New World. MCLEAN: Outcomes. There's going to have to be an outcome for people who don't participate because it all affects us. Remember, we are a community that lives here. CARLSON [bursting into laughter]: I love that: an "outcome"! MCLEAN: There has to be an outcome. CARLSON: Is that what you call it when you spank a child: this is the "outcome"? MCLEAN: I don't spank my children. Fine. But the question was: what would Hillary do? And McLean's evasiveness notwithstanding, we clearly we have our answer.